Want to take your PC gaming experience up a notch or two? Then we have just the competition for you! 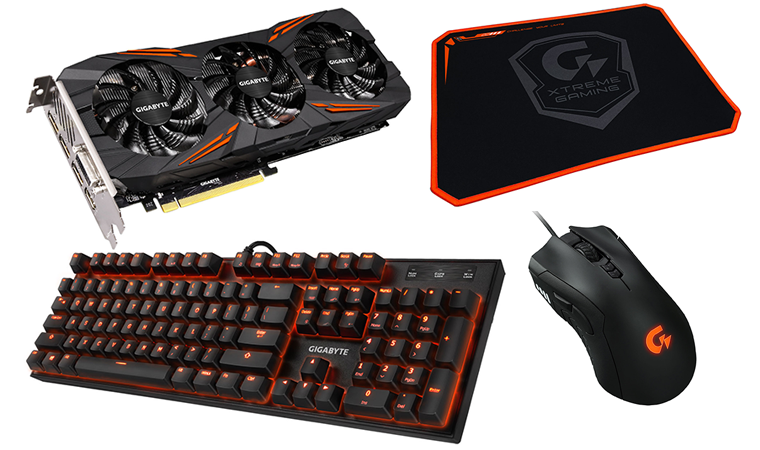 In partnership with Gigabyte, we're giving all our readers the chance to win a GeForce GTX 1070 G1 Gaming graphics card, and we'll also throw in a K85 Force RGB red mechanical gaming keyboard, an Xtreme XM300 RGB optical gaming mouse and an Xtreme XMP300 mouse pad! The entire bundle is worth over £500 at retail and we're giving it away for free. Want to be in with a chance of winning? Answer the following simple question to enter this awesome competition, and don't forget, you can also claim a second entry via Facebook to increase your chances! Need a clue? You'll find the correct answer at facebook.com/gigabyteXGUK. The competition winner will be picked at random from all eligible entries that arrive by 22:00 GMT on the closing date, November 10, 2016. The winners will be notified via email by November 17, 2016. The winner must claim their prize within 7 days of the promoter sending notification. If the prize is unclaimed after this time, HEXUS reserves the right to offer the unclaimed prize to a substitute winner selected in accordance with these rules. Oh boy, this card looks so good even on a picture.. This time may be? How do I want to participate, but alas not pull duty (30%) if the win.